"Kore" stands for "Kotelnikov's recipe"
The widely used Kore 10 Innovative Thinking Toolset was not branded initially. 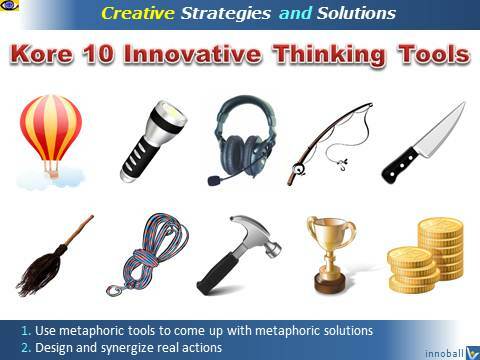 Having created it, I called it '10 Metaphoric Tools', I fine-tuned it on my own innovative projects first. Then I used this method in corporate trainings to help my clients develop super-effective business strategies, create → synergistic innovations and/or → solve complex problems. Every application of the 10 Metaphoric Tools produced truly insightful, inspiring and empowering results. Take a look at this name. "Re" completes the visual and anecdotal meaning for the "RE" in co"RE"
and Business Toolset for Business Tools. (V.1.15) for the first version in 2015. I am suggesting this name because Metaphorical in English usually means something used instead of... Used otherwise it is meaningless. If you wish to use it differently... you will have to define it. Since you have to define it for your usage, then it is better to make up your own word. It is removes the confusion that is likely if someone sees the word and not your definition. If the truth be told however, many persons do not know what metaphorical really means and will miss both your new definition or the old meaning. The wisdom therefore in using your own word is that of it is doing it should be done well and because some Smarty somewhere will take you to task and say, I thought you were using metaphors. I thanked my partner for the great idea and inspiration. Then I sang the song 'Friends Will Be Friends'. Then I added meaning to "Re" ‒ recipe. Finally, I specified that 'Kore 10" is about innovative thinking. Done! But not finished! I renamed my "Top 10 Tips" chapter to "Kore 10 Tips". Other applications of the brand "Kore" will follow.